Mark is a Mechanical Engineer by degree and Founder of Restoration AI. Prior to opening his own Restoration Company in 2009, Mark’s professional career was spent working with large Fortune 500 companies. Restoration AI is the combined result of his technical and professional experience and expertise. 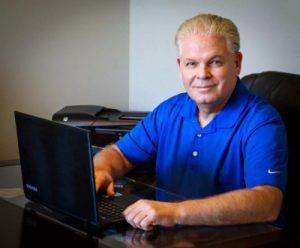 The software tools he has used to successfully grow his Restoration Business, to permanent offices in 3 States, are now being made available to hopefully assist other Contractors to be more effective in working with the Insurance Companies as well as more efficient in their day to day business operations. Not long after his company started building roofs, he found the Insurance Company scopes of loss were consistently short on materials. In general, it wasn’t the measurements but it was the 10%/15% bundling approach used estimating material quantities. For months, Mark spent considerable time at their job sites observing the roof crews and all the trim cuts required to complete a roof replacement. He consulted other experts in the roofing industry and discussed ideas for creating mathematical formulas that would accurately calculate roof waste. It was clear and obvious the 10%/15% approach was completely inaccurate and would underestimate materials the vast majority of the time. Mark spent hundreds of hours creating a Roof Waste Calculator in an Excel format. For years, his company successfully utilized the Excel version of the Roof Waste Calculator to be paid for 100% of the materials required for a complete roof replacement. This tool has been used for over 8 years with thousands of claims. Not once has any Adjuster or Insurance Adjuster questioned the math. Over 1,500 Roofing Contractors across the country downloaded the free Excel Waste Calculator to use on their claims. A few years back, Xactimate introduced their own version and called it Autocalc. The math used in the Roof Waste Calculator yields near identical results to Autocalc. So why do the Insurance Companies refuse to use Autocalc in their estimates? The answer is obvious. The Roof Waste Calculator is the first Tool being introduced by Restoration AI to assist Contractors in their battle to be paid fairly. Soon, a semi automated supplementing tool will be made available that promises to be a game changer. A number of other AI Tools are in the works that will further assist Roof Contractors with their estimates and supplements as well as helping them be much more efficient with their back office efforts. Real change can be made when enough Roofing Contractors are estimating and supplementing in a similar manner. The Insurance Companies will no longer be able to ignore the facts when the facts are presented to them in a professional, documented fashion hundreds and thousands of times per day.